To prepare the panna cotta: Pour the gelatin powder into 1/4 cup of milk in a small bowl and stir until the powder dissolves. Let sit for 5 minutes. In the meantime, remove strips of peel from the two mandarins using a potato peeler. Set the mandarins aside to make the sauce. Cook the cream, sugar and mandarin strips in a pot over medium-low heat, stirring once in a while for 5 minutes or until the sugar has dissolved. Remove from the heat and add the gelatin mixture; stir until the mixture dissolves. Add the vanilla and rest of the milk. Discard the mandarin peel. Pour the mixture into 12 shot glasses. Cover and refrigerate for 8 hours. To make the mandarin sauce: Mix the sugar and the mandarin zest on a clean cutting board. Rub the zest against the sugar with a table knife until the sugar turns orange. Beat the egg yolks, the egg, the sugar mixture, juice, butter and salt in a medium bowl over medium-low heat. Beat over medium heat until it turns to curd, (about 5 minutes). Remove from the heat and pass through a strainer into a medium bowl. Refrigerate until cool. When you're ready to serve, cover the panna cotta in mandarin sauce and grated chocolate, if you like. Panna cotta can also be served in large glasses for a more complete portion. You can store the panna cotta in the fridge for up to 2 days. Panna Cotta is a traditional Italian dessert made with cream, milk, sugar, vanilla and flavor-less gelatin. What I like most about this recipe is that it's easy to prepare and you can make many different versions. 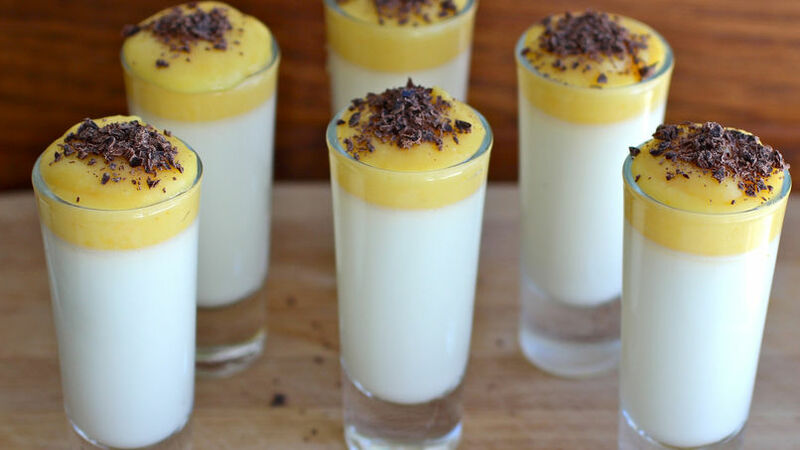 For example, panna cotta can be made with chocolate, coconut, mango, or any flavor you like. This time I’m preparing it with mandarin, one of my favorite fruits, and it turned out delicious! On special occasions I like serving my guests mini-desserts in shot glasses because the presentation is very pretty and no one leaves any leftovers!